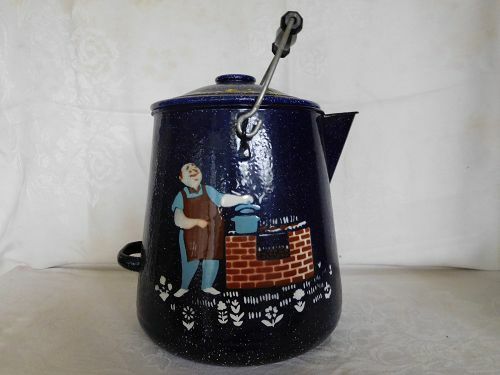 This is a very nice primitive western kettle. Large side of 8” wide at the base x 6 ½” at the top x 9 ½” high, with a side handle. Metal over all handle with a central wood hand piece. White splatter on dark blue metal, it bears the very detailed décor of a cook at his brick oven/cook stove. The décor appears to be made of a thin layer of porcelain creating a relief. On the lid, written in yellow, it says “Come on in, the party is fine”. Excellent condition for this rare piece of cookware.